I only need two things in the morning: a toothbrush and a cup of coffee. If I don’t get to brush my teeth, I feel gross and grouchy all day. But if I don’t get the coffee, well, I don’t even have a day. I just go back to sleep. That’s why the Bodum’s Crema French Press 8 Cup Coffee Maker (10883-01) is my favorite kitchen toy. Bodum’s Crema features a minimal design that is elegant and functional – it produces one mean cup of joe. If you’ve never used a French Press before, you shouldn’t be intimidated. The process is a little more involved than with an automatic drip coffee maker but it really isn’t hard. And since there are no paper filters involved to absorb the coffee oils, the French Press produces a much better tasting brew (Howard Schulz mentions this in Onward, How Starbucks Fought for Its Life Without Losing Its Soul). To get your caffeine fix, first throw some coffee (about three tablespoons) into the temperature-safe borosilicate glass carafe. It needs to be temperature-safe because the next step is filling the carafe at last half full with almost boiling water (boiling water will burn your coffee!). The simple plastic handle and base protect your hands and tabletops. Give the coffee a quick stir and pop on the safety lid but leave the plunger up while the coffee brews (3-6 minutes, depending on taste and type of coffee). Then slowly press the grounds down with the cute little plunger. And voila: fresh java! The Crema French Press 8 Cup is a great option for any coffee-drinker who doesn’t want to mess with filters or electronics. Since the parts are all dishwasher safe, you can just pour the grounds in the compost, pop the pieces in the dishwasher and head to work (or play). This product (or any French Press) is probably not for you if you like to keep a pot of coffee sitting on the counter all day – it will be stone cold within the hour. I will also say that, though I own the 8 Cup French Press, I can’t imagine how anyone could get eight cups out of it. Even if I completely fill the carafe, I only get 3.5 servings in my medium-sized mug. Bodum also offers a Crema style French Press with a metallic base, if you prefer a little glitz in your kitchen. Either way, this coffee maker is a great deal at only $19.95. 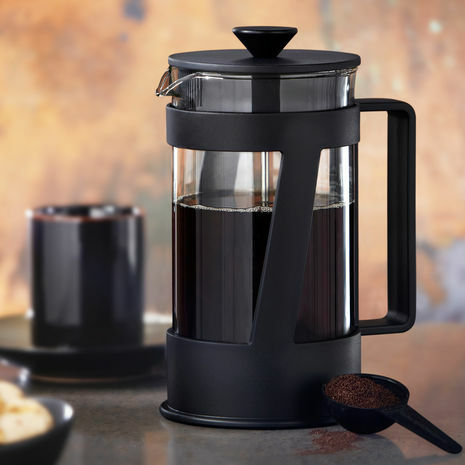 You can order the Crema by Bodum online or pick one up at any Starbucks.